Rabbit Ings is a country park located on the former colliery yard and spoil heap of the Monkton Colliery and then the Royston Drift Mine, which closed in 1989. The 64-hectare site, situated near Royston in South Yorkshire, is home to an array of wildlife – including newts, snakes and herons. The park provides soaring footpaths and cycle tracks that offer stunning views, as well as sports pitches for use by the community. Rabbit Ings was officially opened in 2011 under the ownership of Wakefield Council. 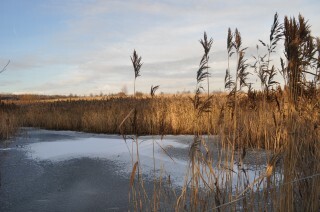 In 2012 the Council transferred the land into the ownership of the Land Trust. A striking image of a rabbit is carved on the hillside which can be seen from miles around. The rabbit, similar to the black rabbit on Watership Down, is a Norse image which ties in with the name of the site – ‘ings’ being a Norse word or description of low lying wetland and of course a rabbit! The rabbit was created with the help of 192 local school children. Spectacular views can be enjoyed from the viewpoint at the top of the hill. 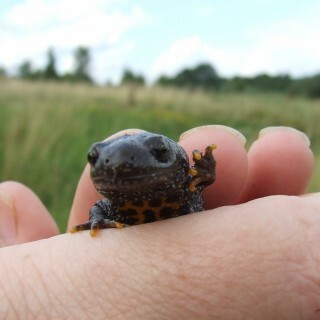 Whilst at the foot of the hill woodland and wetland provide a marvellous variety of habitats where wildlife can thrive. In springtime Skylarks, Wheatear and Meadow Pipits fill the park with glorious birdsong. Yes. Toilets are located at the back of the Visitor Centre, by the car park. Walking - Our extensive path network offers a variety of walks suitable for differing levels of fitness. 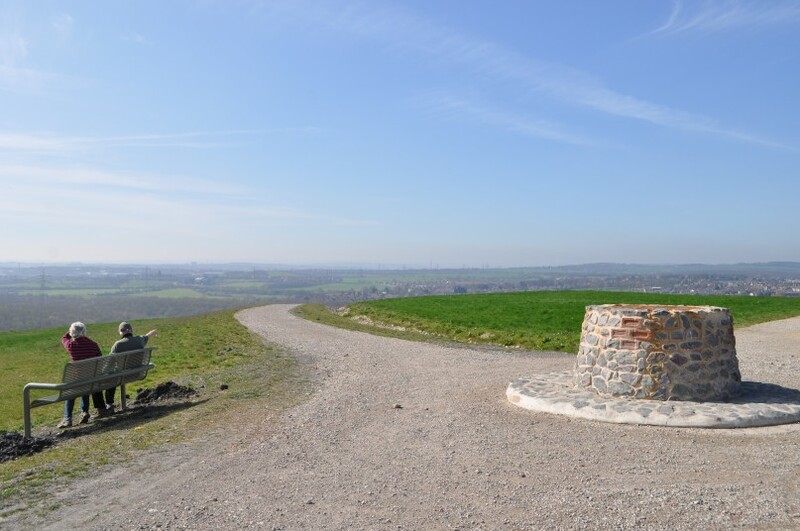 There are benches around the site offering a place to rest and good views; Cycling - The hard surfaced paths are ideal for a family cycle while the hill provides for those looking for more of a challenge! There's a winding bike trail from the top of the hill down the western slope that offers a thrilling ride; Horse riding - There is easy access on to site for horse riders at each entry point as well as a bridleway. Further to this, we have a grass canter track on the North slope where you can stretch the horse's legs a little; Den building - Our woodland habitat offers a great place for young people to learn how to make their own shelter. ; Pond dipping - Learn what fascinating creatures live under the water at our classroom pond; Minibeast hunt - Sweep netting in our extensive grasslands can turn up all sorts of interesting bugs, from colourful beetles to slimy snails! 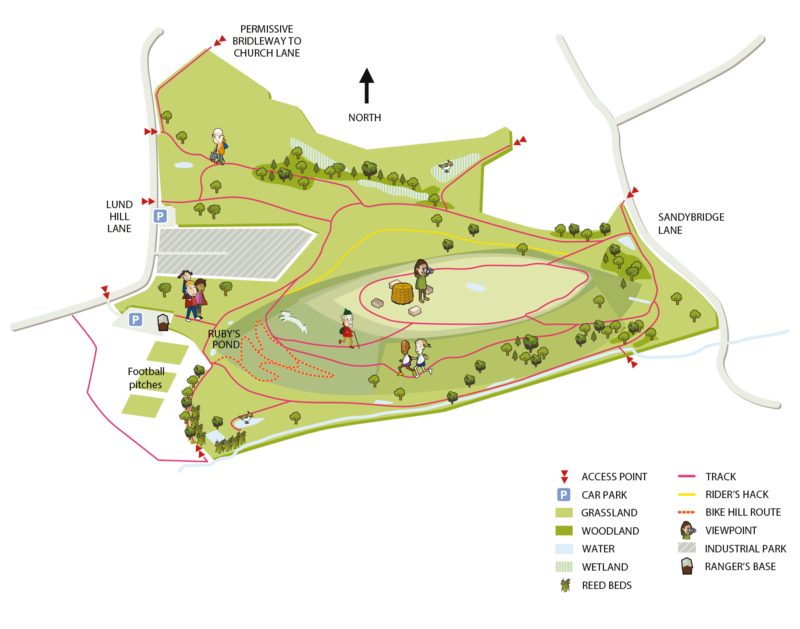 ; Sports pitches - We have three football pitches and an event field by the car park that can be hired. We also have two changing rooms and a referees room; Classroom & meeting room - we have a heated room with tables, chairs, projector space and tea & coffee facilities available for workshops, conferences and staff away days; Geocaching - Rabbit Ings has a number of Geocaches established, why not see if you can find them? ; School trips - Our rangers are available to lead guided walks and activities on the park for your school; Staff away days - We offer the use of our meeting room and we have the capacity to host team building activities, as well as volunteer conservation work, such as tree planting. There are woodlands and wetlands, providing a variety of habitats for wildlife, including Skylarks, Wheatear and Meadow Pipits in spring. If you're lucky, you may also spot Kestrels overhead. Rabbit Ings is a country park located on the former colliery yard and spoil heap of the Monkton Colliery and then the Royston Drift Mine which closed in 1989. The 64-hectare site, situated near Royston in South Yorkshire, was officially opened in 2011 under the ownership of Wakefield Council. In 2012 the Council transferred the land into the ownership of the Land Trust. The reclamation of the site was supported through the Government’s National Coalfield Programme being implemented by the Homes and Communities Agency in partnership with Wakefield Council and Yorkshire Forward. The site had suffered environmental degradation with large areas of bare shale. The slopes of the 40m high tip were very steep in places and were potentially dangerous. Part of the reclamation scheme involved earth moving to lessen the slopes and make it possible for new vegetation to become established. Over 130,000 tonnes of soil making material have been used on site to create new areas of woodland, heathland and grassland habitats. New footpaths and cycle tracks have been created and there are areas of extensive tree and shrub planting, as well as sports pitches for use by the community.